150W per channel at 8 ohms or 250W per channel at 4 ohms. 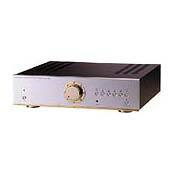 Separate power supplies for the amplifier and preamplifier sections. Separate power transformers for each channel. Musical Fidelity's A3 Integrated Amp and the A3 pre/power combo are breathtaking. I have no doubts that they are the best in the world (aside from other MF amps) compared to anything up to 3 times their cost. I STRONGLY recommend pairing them with B&W speakers. You'll want to leave work early every day for a month just to hear how incredible music can be. My previous system was a Conrad Johnson preamp (10a) with a B&K Sonata Power amp, B&W 640s, and a Klipsch powered dual 15" subwoofer. I bought them all off a guy for $1,500...the sub alone retailed for $900, so I was very lucky. Each other item was over $1,000 new. This system just killed (I also used a Classe' preamp, but preferred the CJ), I had never heard anything like it. I had to sell the CJ, B&K, and Classe', but kept the B&Ws and Klipsch sub. Recently I replaced it with a Musical Fidelity A3 Integrated Amp. The CJ/B&K combo was amazing. The A3 blew my mind. (Actually jaw-dropping). And I'm using a fairly cheap Harman Kardan cd player (can't wait to get a nice dc player, and can't imagine music sounding any better than it does...but I've been assured it will). I have bought, auditioned, and returned a ton of used equipment, which was all "audiophile" stuff (ie. Meridian, Classe', conrad johnson, etc. ), and the Musical fidelity A3 has by far blown everything else away. I can't stress how important matching the right speakers to your amplifier is. I hated Martin Logans, Ushers, and Klipsch Floor Speakers (not hated, but they were WAY outclassed by the B&Ws). Everyone has their own taste. I've heard people say the B&W DM640s are bass heavy,,,and I use the with a 150Watt powered dual 15'' sub, which I greatly prefer!! That being said, I cannot comment highly enough about the Musical Fidelity A3 Amp. One review I read hit it dead on: It is very clear, sweet sounding, great soundstaging, and EXTREMELY musical, but it has a unique (to me) intangible: It is lively! The music has energy which the Conrad Johnson/B&K (and everything I've heard) just can't approach. With B&Ws and a great Klipsch sub, I can't beieve what I got. Zeppelin music that i've listened to for 20 years (and thought that I was just "burned out" over) has literally sent chills down my spine as I "discovered" them on the A3. I cannot believe how much "more" they had to offer with just a different Amp (and the Conrad Johnson B&K combo was not a 'slouch' by any means...utterly blowing them away for $600, or for $2,600 for that matter, still has me shocked...I thought they were about as good as a setup as anything short of BIG money gear). My friend went out and bought an A3 pre-amp/power amp combo after hearing mine (and B&W DM640s...the copycat!). I want to note that the MF power ratings seem absurdly conversative. His 120 watt amp seems at least twice as powerful (and infinitly better) than the Hafler 250 Watt power amp he replaced. This is the only eview I have ever written. To anyone who wants a system that brings the :magic: out of music, listen to a Musical Fidelity amp. I haven't heard anything like it in my life. Just listen to one...you'll get it. Lively, vivid presentation and plenty of power. This is my second go round with the A300 as I owned one a few years ago. It was actually my first high end amp and after many different pieces of equipment including the Sim I5 and the Pathos Classic One V2 I bought this again. It works extremely well with my ProAc Tablette 50's. It is a lively performer and I like the phono stage. I replaced the Pathos with this because I wanted the phono stage having remembered how well it went with my Rega turntable. And after selling the Pathos and putting the MF A300 in the system, I discovered the difference between the 70wpc of the Pathos and the 150wpc of the A300. The Pathos would run out of steam at moderately higher listening levels than the MF A300. The A300 is a bit more forward but it sounds really good in my set up. The Pathos was a great amp for quiet late night listening but I don't miss it. At the prices you can get an A300 on Audiogon for nowadays you really can't miss. I hope to be able to purchase a pair of Dynaudio 1.3's soon . Right before I sold my first A300 i heard this combination and I thought it was magic. This is my second go round with the A300. I am replacing a Pathos Classic One v2 that I sold. The Pathos was really good but it does run out of steam with only 70 watts. It's not even that I listen all that loud but the MF A300 is definately a livelier performer. At the price these are going for on Audiogon now, you can't go wrong . I like the phono stage. The amp performs well with my ProAc Tablette 50's. It can be a tad forward with them and I hope to pair it with some Dynaudio 1.3's shortly. I highly recommended this piece at it's original price of 1500 and now at it's current prices on Audiogon, you can't miss. I had very high expectations for the Musical Fidelity A300, which was at the time the most expensive used piece of equipment I had ever purchased. Initially, I was quite upset with the way my NHT ST-4's sounded when driven by the A300, but after about 4-5 months of listening, I have grown accustomed to the A300's idiosyncratic sound. The most apt description of this sound is, in the words of a previous reviewer, "warm at the expense of detail." The A300, at least for me, took a lot of getting used to, and I still can't say I'm not slightly disappointed. However, I have had a lot of moments where I have genuinely enjoyed the large expansive soundstage the A300 creates. If you like very big and warm non-clinical sound with a lot of bass (and I mean a LOT of bass), then the A300 may be for you. For value, I gave this 4 stars because of the relatively low price I paid for this. At MSRP, I would give this 3 stars. Overall, I gave the product 3 stars as I feel the particular "sound" of the A300 may not be appealing to a lot of listeners who like detail. Build quality. this thing weighs a ton! I picked it up and a Creek that I was considering and it made the Creek feel like a toy. Nice clean look, 5 YEAR WARRANTY! Sound, of course. Grace, grace, and more grace. This is one fine product. No main-in for use with external amp or active crossover. Stunning build. Fantastic lower and higher end force, crunch, drive, and capability. The real definition of a solid-state amp--lots of power, lots of force, but lacked the engaging warm/sweet midrange personality of other units. Although I do not own this unit, it has been a goal of mine for quite some time (the A300 paired with the A3 CD player is a fantastic combo, and something I've been wanting to buy for quite some time). Recently, ready to buy an integrated amp, I did a substantial (solid 2 hours, with my own disc's) listening session of this amp v. the Arcam A75 Plus v. the NAD C370. The C370 I immediately didn't like, simply because it sounded like what it was--an inexpensive, power-hungry oaf. I felt that it lacked personality, which is something I like from my components, and therefore the music was not engaging for me. So I quickly moved onto the A300 and the A75 Plus. I'll start by saying that the store where I listened sold the A75 Plus for around $999, and the A300 for around $1,400--the difference I heard was worth $400. Yet I must admit that the Arcam could respectfully be compared to the A300 in many ways, and in some ways I prefer the A75 Plus. As far as build quality goes, there is really no comparison--the A300 is a beastly tank of a component, with a gorgeous metallic front panel that screams quality. All of its knobs just felt higher quality. It also weighed way more than the A75 Plus, which seemed like a plastic joke toy in build comparison. What A75 Plus lacks in sound is the sheer clean power that the Musical Fidelity unit provides--which gave the A300's signature sound of drive, force, and an overall forward musical presentation. The A300 could hammer the lower-end home with precision and effectiveness, and at the same time could give the highs that raw and detailed accuracy that clean and powerful units are known for. Yet I found that in the mid-range, in the way that both units presented vocals, that the A75 Plus was just a bit more engaging and musical. The A300 sounded like I was listening to a very high-quality solid state component, but the A75 Plus was more tube-like (which I tend to prefer), offering a warm and sweet personality that the A300 lacked. But then there's that low and high-end loss with the A75 Plus, a unit that provided solid, punchy, and accurate bass (though uneventful compared to the A300), and slightly rolled-off and less-detailed highs (although cymbals did sound full-bodied and did effectively shimmer and hover). In the end, when I nabbed the A75 Plus off EBay for $450, I never looked back. Although I would still prefer the A300, I feel that for each unit’s gain over the other, there is a loss as well. I was surprised in my listening sessions that two solid-state, comparably priced integrated competitors could sound so very different, and I loved every minute I spend with the two. My final comment is that although I prefer the A300, for the $1,000 I saved, I am thrilled and I don't think anyone would argue that the difference between these units is worth that much ($400 is one thing, but $1,000 is an obvious choice). The Arcam made CD's much more enjoyable for me, while the A300 almost didn't sound like a CD at all--it didn't have any digital edge to it whatsoever. Anyway, that is my comparison. Can be easily sold in the used market. Finishing can be better. Not compatible to JM Labs and Epos. The big reviews in magazines led me to buy this. The amp is totally not compatible to JM Labs and Epos speakers. Sounded OK with B&W CDMs, but still dry and thin on vocals. Spent 4 months trying all cables & isolation system to get the bass and mids. I ended up selling the A300 in the used market. The JM Labs and EPOs are great sounding speakers, and driven easily by the valve 28 wpc Copland 401. Unfortunately, the A300 does not work on my system, on 150 wpc. Mid is a little too dry. Warm at the expense of details. Lacks power during demanding passages (in terms of complexity or loudness or both). Words of advice (1): Many dishonest retailers sell the B-stock as A-stock, beware! Words of advice (2): It appears that A300 has 2 models. The earlier model has the gold trim. The newer model has the platinum trim which indicates the upgraded parts and transformer. I have been told by fellow audiophiles that the earlier (gold trim) model sounds better. This review is for the gold trim model. Words of advice (3): I think the A300.2 is out? This little integrated amp gets you good bang for the buck. It surely is no match against many of the setups I have before (see similar products used). But for less than $1000 used, how much could you ask for? The 150w/ch into 8ohms, 250w/ch into 4 ohms rating is misleading. It has a tough time driving my Revel F30 (87db, 6ohm) when playing reasonable complex orchestral passages. Either it sounds like jumble-mumble, or all the punch/attacks are gone. And don't get me started about my experience of matching it with B&W 801 Matrix Series 2. The female vocal is better than I expected, but then again, you can't buy miracle with $1000. Soundstage, imaging precision and clarity are also not as good. If you have the luxury to do equipment matching, I think the Krell 300i is a WAY BETTER choice ($1200 used). Spending a few hundred bucks more and you could try the McIntosh MA6500. Finally, the EAR SET tube integrated is a good choice too. The remote as as cheap as you could possibly get. *Big sound stage *Very powerful *Very nice detail *Deep and detailed bass *Articulate and smooth midrange *High frequencies sweet and detailed but never fatiguing *Great build quality. *They don't make them anymore. Amps from Bryston, Linn, Naim, Cyrus, Cambridge Audio, and the Musical Fidelity A3.